Been diving in Froggy Lair? Please Vote! 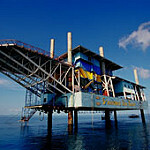 This is a very unusual dive site and is a well-known dive site for critters and macro life. Consequently, it is a very popular dive site for macro underwater photographers who come to capture some of the strange smaller marine life that is found in abundance at this dive site. There is not very much to see at this site, until divers look closer to the smaller life, suspended right in front of you. The site is very shallow and is around 5 to 10 metres deep. The visibility is poor often not getting above 5 metres but this is for good reason. The waters are full of small unusual species that are amongst the suspended particles floating around. Rather than looking into the distance to spot marine life, divers will need to look right in front of their eyes. Dive masters are crucial for this dive in assisting divers to spot the unusual species. Divers are going to find many different types of nudibranchs, with every colour and shape imaginable found here. There are many ghost pipefish and frogfish of various size and colours. There are two large frogfish resident here; they are blue and have grown to the size of a football. Flamboyant cuttlefish are also commonly spotted here and this is a real attraction for all divers. It is most often seen at night but can be spotted on day trips as well. Map of Mabul, Froggy Lair dive site.